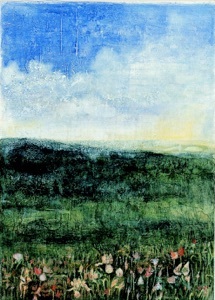 Margaret Krug MFA, School of the Art Institute of Chicago, has exhibited at AIR Gallery, The Painting Center, The Whitney Museum of American Art, Front Art Space, The National Arts Club, The Window Gallery, The Nix Gallery, and Vlepo Gallery in New York City and at the Art Institute of Chicago, the Nelson-Atkins Museum, The Willa Cather Foundation, and elsewhere throughout the United States, Europe, and South America. She is the director of a painting, drawing and art history program at the Spannocchia Foundation in Italy. Krug is an Associate Professor at Parsons School of Design. She is an Artist Mentor at Lesley University College of Art and Design, Lesley Art + Design, MFA in the Visual Arts Program, Cambridge, Massachusetts. She is a contributing writer for Artist’s magazine. She is a former Senior Lecturer at the Whitney Museum of American Art. She taught painting, materials and techniques, at the School of the Art Institute of Chicago. Krug was awarded the School of the Art Institute of Chicago Traveling Fellowship Award for Painting: George D. and Isabella A. Brown Traveling Fellowship. In 2008 she was awarded the Art and Art History Distinguished Alumni Award from the University of Nebraska Omaha. Her book, An Artist’s Handbook: Materials and Techniques, was published by Harry N. Abrams in New York and Laurence King Publishing (distributed worldwide by Thames and Hudson) in London in 2008. Blume in Barcelona published the Spanish edition, Dumont Publishing in Cologne published the German edition, and Art Publish published the Russian edition. Anhui Fine Arts Publishing published the Chinese edition in Shanghai. In 2010 her book received the “Jinguang” (golden light) award in China. Laurence King Publishing published a Special Edition, 2011, and a Second Printing, 2012 (distributed worldwide by Thames and Hudson and in the United States by Chronicle Books). Krug is at work on a forthcoming book on color and composition. She was born in Sioux Falls, South Dakota and lives in New York City. Margaret Krug is available for talks at bookstores, museums, galleries, schools, arts organizations, and reading groups. You can contact her at Margaret.krug@gmail.com. I am fascinated by materials and the processes of making art. Each material has a unique identity – a smell, a feel, and a touch – and response to motive and action. I work in relationship with materials by allowing them to inform me on how to use them in representing my lived experience. I do this work because it makes me profoundly happy. The paintings maintain evidence of their beginnings throughout the process of their creation, and physically manifest my interest in the vitality of memory and presence. I slowly develop pools and veils of color, and then work, excavate and rework the surface to create an atmospheric pictorial space, that can expose my own emotional state, and provide an avenue for connection with a greater emotional field. My influences are literature and the history of art. The words and the structure of the writings of Italo Calvino, Samuel Taylor Coleridge, Leo Tolstoy, Dante Alighieri, Willa Cather, John Millington Synge and Flannery O'Connor among others inspire me to paint. A focus on the synthesis of eastern and western motifs found in paintings by early Renaissance Sienese painters such as Duccio di Buonisegna, Simone Martini, and Pietro Lorenzetti and the infusion of a tender light by early Renaissance Venetian painter, Giovanni Bellini is exemplary of my in interest in the history, literature and vocabulary of art. Willem de Kooning’s luscious, juicy brushstrokes suggest to me an exuberant relationship with the materiality of paint; conversely the extreme delicacy of Agnes Martin’s touch gives evidence of the minute fluctuations of her hand. Drawing is a constant pursuit. In addition to exploratory and preparatory sketches and cartoons for paintings, my current endeavors involve a series of studies of family, ancestors, and, most recently, literary figures, which explore their history and identity. I do not know some of the individuals from the family and ancestor studies, and I know a little about others through fascinating although vague stories. In the best circumstances, I work from life. Most often, I work from a single small faded photograph. What often emerges is an image of an individual ancestor imbued with the memory of the characteristics of a current family member. For a project I have entitled Faces and Flora, literary figures who influence me are paired with flowers cited in their writings. For most of the studies, I have left the background a blank space. The studies in themselves are compelling and the empty background allows me - and by extension the observer - to have an open field for projection. Upon each viewing, the imagined scene remains limited only by the boundaries of the individual imagination.